Regardless of who wins the election today, that man will proceed forward with the knowledge that half of the voting public did not support him. Regardless of which candidate "wins," he will struggle to act with a similarly divided Congress. 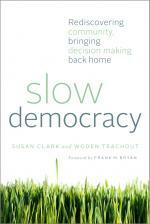 If there ever was a time for a book like Susan Clark's and Woden Teachout's Slow Democracy, that time is today. Early in its pages, Clark and Teachout poke fun at their own title: who wants their democracy to be "slow"? Yet rather than snail's pace, Clark and Teachout had a very different definition in mind. Building from the energy of the Slow Food movement, they envision recapturing some of the more intangible and precious aspects of democracy -- aspects which America has abandoned in our relentless pursuit of "efficiency." The other day I was having a conversation with some new friends at one of the great Wilkinsburg community gardens, the topic of the conversation was yield. You see... Community gardens are often plots of land with very few perennials, shrubs or trees... Recently some of the community gardens in my area have begun planting fruit trees. So you’ve read plenty about The Great Turning our society is going through. And you fully understand that the old ways are fading away, and that your “job,” your career, your livelihood is going to look kind of different. It's late summer with hints of autumn, and the mourning dove nest in the pot on my baker's rack sits empty now. My family watched as the two little chicks had their flying lessons. The young doves lingered near the nest for another two nights, and then they left for good. On occasion, I still see them foraging -- not quite fully grown, nor altogether capable, but they do all right on their own. As initiator of Transition action in Los Angeles, I've been doing a bit of the "empty nest" syndrome myself. For successful initiators in large areas worldwide, the empty nest phenomenon is part of the natural and evolving Transition journey of building local community. Some communities are beginning to set up "gift circles" -- a collection of people who want to engage in gifting practices on a regular basis. But you don't need to wait for an official gift circle. Here's how you can get gift economy concepts rolling right now. If your entire life is nothing but money transactions, ... then you don't have community because you don't need anybody. Food security and food justice, energy consumption, community health and resilience, ecological well-being, air quality and world peace: these are just some of the issues that actions registered as part of the May Transition Challenge have been addressing. We’ve seen them over and over, addressed from every angle and each with a creative twist. From a specially-designed growing dome that provides the ideal environment for a vegetable garden at 8500 feet above sea level, to a one-man operation that monitors chemical trails in the skies over Milwaukee and publishes the results online for community members to see, to a summit in Nairobi, Kenya, run for and by teenagers to start engaging in dialogue and working towards creating a culture of sustainable peace, these are just some of the things we have done this May. Here are 7 things your group can do to further positive change. Here is a link to a two-sided handout version (pdf) that I created in anticipation of a speaking engagement. It was written for church communities and other organizations which are interested in participating in the Transition process.